It is very unusual for retired senior officers of a professional military to end up fighting alongside militants attacking soldiers they once commanded. But the recently reported saga of retired Lt. General Shahid Aziz — whose 37-year service in the Pakistan army included postings as director-general military operations, chief of general staff from October 2001 to December 2003, and commander of the IV Corps in Lahore from December 2003 to October 2005 — points to the hazard of allowing ideology to supercede professionalism in a modern military. After retiring from the military, Aziz was appointed chairman of the National Accountability Bureau, a post he left in May 2007. His heart, however, was in Jihad. General Pervez Musharraf, under whom Lt. General Aziz served in top positions, recently said in a television interview that he had learned about Aziz growing a long beard, going to Syria to fight alongside ISIS or some other Jihadi group, and being killed there. Other reports suggested that he had gone to Afghanistan several months ago “to compensate for what he had done in favour of US troops” and it was in Afghanistan that he died. Aziz has not been heard from for quite some time and some members of his family have confirmed that he left the country around January-February 2016. Apparently he just disappeared, leaving his mobile phone at home. The family kept receiving emails and SMS text messages informing them that he was alive and well. But for several months even these messages had stopped. Reports suggest he had gone to Kunar in Afghanistan, across the border from Pakistan, and joined the forces of the Islamic State in Khurasan there. Subsequently reports came that he had gone on to Syria and that he was either killed in US bombing in Jalalabad, Afghanistan or in Syria. For the sake of Aziz’s family, one hopes that his son is right but all evidence suggests that his statement is meant to save face for the family as well as Pakistan’s army. Aziz was never a private person, as suggested by his son, and has always been very public about his religious and political stances. The retired general revealed his preference for an Islamist Pakistan in his 2013 book, Yeh Khamoshi Kahan Tak: Ek Sipahi ki Dastan-e-Ishq-o-Junoon (How Long This Silence: A Soldier’s Story of Passion and Madness). Aziz was not a marginal figure in the Pakistan military. He fought in Kashmir and was trained at the National Defence University. As major general, he headed the analysis wing of the ISI and as director-general military operations (DGMO) in 1999, he was involved with planning and executing the overthrow of Nawaz Sharif’s elected government. In 2001, after 9/11, Aziz served as CGS, a position that often leads to ascent as army chief. His going off the reservation is not comparable to the occasional military officer embracing conspiracy theories or going somewhat batty –something unfortunately not unknown to most militaries. In his book, Aziz speaks of the ‘eye of Dajjal’ (Antichrist) on the US dollar bill, which to him symbolizes ‘the grand conspiracy set in motion by the Freemasons and many powerful families in league with the American Neocons’. In his world view, all major events in the world were ‘in line with the Jewish conspiracy outlined in The Protocols of the Elders of Zion’, notwithstanding the fact that the protocols have been proved to be a European anti-Semitic forgery. For him, ‘only the Quran stands in the way’ of the modern world’s ‘Satanic way of life’. His desire to join ISIS to compensate for the wrong he committed by being part of Pakistan army’s cooperation with the United States was likely inspired by his belief that the army he served for 37 years had fallen into the ways of the devil. There are other senior Pakistan army officers, too, who have crossed over from being sponsors of Jihadi activity as strategic action on behalf of a professional military to becoming true believers in extremist causes. The most prominent example is that of Lt Gen. Hamid Gul —another ideologue who was within reach of leading the world’s sixth largest army. Gul had commanded two of Pakistan’s top strike formations and headed both Military Intelligence (MI) and Inter-Services Intelligence (ISI) agencies. He publicly declared that he could not accept a state not based on Islam and saw nothing wrong in his reaching out to the Haqqani Network in Afghanistan and supporting the rise of the Taliban inside Pakistan. Gul almost boasted about rigging the 1990 election while in uniform to oust the Pakistan People’s Party (PPP) from government. He maintained that all his actions were aimed at protecting Pakistan from external and internal enemies even when he acted outside the chain of command or in violation of the country’s Constitution. 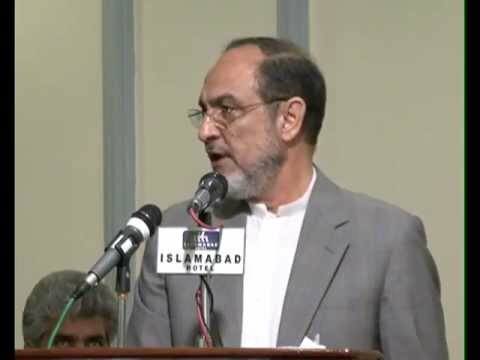 The long list of general officers combining conspiracy theories, Islamist ideology and the concept of Pakistan being permanently under threat includes former ISI chief Lt. General Javed Nasir, who bragged about violating international sanctions while arming Mujahideen in former Yugoslavia, and Major General Zaheerul Islam Abbasi, who was arrested while trying to orchestrate ‘an Islamic coup’ in 1995 to create a regime ‘based on Quran and Sunnah’. Then there was Brigadier Amir Sultan Tarar, a Special Operations officer trained at Fort Bragg in North Carolina, United States, who earned fame as ‘Colonel Imam’ while fighting alongside Taliban that he had trained. ‘Colonel Imam’ refused to accept General Musharraf’s decision to side with the US after 9/11 and supported the Afghan Taliban publicly. The Taliban, however, were not sure of his loyalties. Brigadier Tarar was kidnapped by a splinter Jihadi group along with fellow former ISI officer, Squadron Leader Khalid Khawaja, British journalist Asad Qureshi, and Qureshi’s driver Rustam Khan in March 2010. Although Qureshi and his driver were released in September, Khawaja was killed within a month of the kidnapping and Brigadier Tarar was killed in January 2011 by Al-Qaeda affiliate Lashkar-e-Jhangvi Al-Alami. The stories of these officers should ring alarm bells among the top echelons of Pakistan’s armed forces. An army cannot afford to allow so many ideologically motivated hardliners to rise to senior ranks and to freelance on behalf of their ideology after retirement. From Hamid Gul to Shahid Aziz, some bright alums of the Pakistan Military Academy ended up siding with groups that have attacked and killed Pakistani soldiers. This is a travesty that must be studied and understood instead of being covered up. The current COAS, General Qamar Bajwa, has publicly spoken of his desire to close the chapter on his institution’s embrace of extremist ideology. If that is to happen, it is imperative that Pakistan discuss openly the ideological distortions that led some of its retired generals to become fellow travellers of groups such as ISIS and Al-Qaeda. Course correction is not possible without recognizing what went wrong. Hussain Haqqani is a turn coat and opportunist…..
60 YEARS late and billions of $$ short, Haqqani…given that the army took over in 1958 and made hate of India THE raison-d’etre of the then-unified Pornistan (despite of the warnings of Maulana Bhashani, no friend of India) and was reinforced in this by the only civilian to have actually ruled post-1958 (the LOSER of the 1970 election who refused to accept Mujib as PM, and gave the army an excuse to unleash a reign-of-terror), “allowed” is an understatement — indeed extremist ideology was MANDATORY from 1958 onwards! Your country’s opportunity to remedy it was immediately after 1971/12/16, when ZA Bhutto could have emulated Konrad Adenauer and purged the army of such Naziesque criminals as had caused the nation to split — instead, he PROMOTED one of the criminals (and after that POS retired, a sympathiser of them — proven beyond-doubt by his appointment of STILL ANOTHER war-criminal as his press-officer)! Whatever floats your boat Hussain, I’m glad you’ve got people who buy whatever your imaginative mind whips up. An eye-opener of an expose of the deep corruption and the underlying mixture of ineptitude and incompetence that should send a shiver down the spine of any sensible military analysts at the Pentagon, the State Department and indeed the Whitehouse for this a failed country with a nuclear arsenal. I have come to know Ambassador Haqqani in the recent months to be a man of great learning and insight about the Sout Asia’s history, culture and politics second to none. This is most alarming an insight one which we should not downplay or ignore, I hope the powers that be have taken a full measure of this reported business and act accordingly to quickly dismantling this ridiculous failed state to continue like a most lethal zombie. I can’t express more the great debt of gratitude and indebtedness I feel toward Amb. Haqqani to help us see the extent of the internal Islamic rot of this unfortunate bastardy of a nation that is arrested in the iron-claws of the Army-Cabal. Well written , a check has to be kept on extremists within Army ranks from top to bottom. Sometimes an impression is created as if their are two groups, extremists and moderates. Such a division if there can be harmful to the state and enemies can fan this situation to their advantage.Pakistan intelligence service is the best in the world, it needs to look into such stories circulating on social media. Both Gen Pervez Musharraf and Gen Shahid Aziz are Muhajirs. And their families are connected through marriages. Aziz himself said in an interview on Pakistani TV channel that since he hails from Allahabad and Musharraf from Delhi lot of marriages have taken place between the two families. However, the real of fallout between the two was that as head of analysis wing of ISI, Aziz had sent a questionnaire to units involved in Kargil misadventure and asked them to spell out reasons for the failure. When Musharraf came to know about this he immediately ordered him to withdraw the questionnaire and transferred him.